Those who tout the Original “Missing” 13th Amendment as the one and only legitimate 13th Amendment, claim that it was duly and legally ratified and ripped out of the Constitution because it banned lawyers and the descendants of the manor born (royalty and privileged class) from serving in the government. 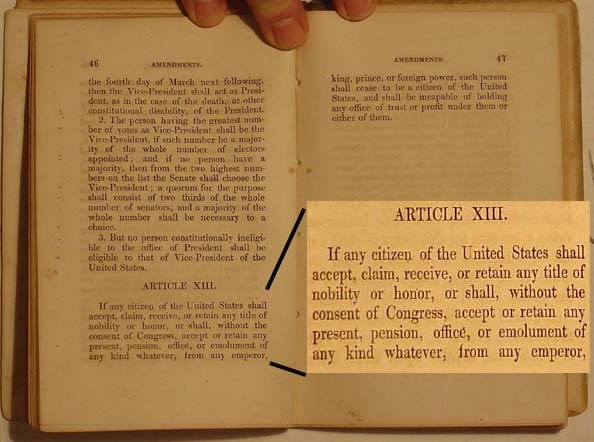 Volumes of Internet articles written by various authors claim their version of the 13th Amendment was ratified in 1812 or, at the latest, in 1819. 1) What is the Original 13th Amendment and what does it mean. 2) What happened to it and why.